Donovan McNabb will be the last Philadelphia Eagle to ever wear #5. Former Philadelphia Eagles quarterback Donovan McNabb retired officially as an Eagle on Monday. He tweeted before the retirement ceremony, “Officially retiring as a Philadelphia Eagle today. Unbelievable feeling. Dreams do come true.” Well, McNabb will have another chance to relive those glory days in Philadelphia when the Eagles retire his #5 jersey at halftime of their September 19th game against the Kansas City Chiefs (which will also mark the return of former Eagles coach Andy Reid). A standout quarterback at Syracuse University, McNabb was selected by Philadelphia with the 2nd overall pick in the 1999 NFL Draft. And in true Philadelphia sports fashion, Eagles fans heavily booed McNabb at the Draft because Eagles fans wanted the team to draft running back Ricky Williams. Over the next 11 seasons, McNabb would lead the Eagles to unprecedented heights. During his tenure as quarterback, McNabb led Philadelphia to eight playoff appearances, 5 NFC East division titles, and the 2004 NFC Championship. He holds several Eagles records, including most wins (101, including playoffs), attempts (4,746), completions (2,801), yards (32,873) and touchdowns (216). He also rushed for 3,249 yards and 32 touchdowns for Philadelphia. He was named to 6 Pro Bowls. But for all the great stats, some Eagles fans (or bitter ex-Eagles fans writing this article) still remember McNabb’s shortcomings. He reached the NFC Championship Game three times from 2001-03, failing to win any of those three. He also displayed poor game management in the fourth quarter of Super Bowl XXXIX against the New England Patriots. McNabb was ill that game, and even vomited on the field during the Eagles’ final drive, which ended with a McNabb interception to Patriots’ safety Rodney Harrison. 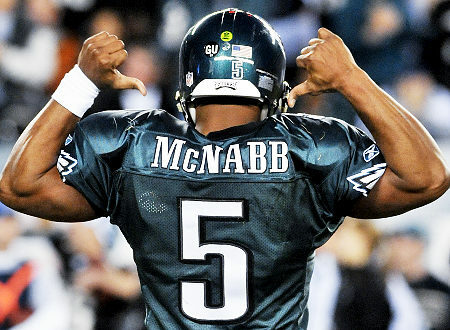 Still, McNabb is one of the greatest quarterbacks to grace the field in Philadelphia, if not the greatest. He was the face of the Eagles franchise throughout the 2000s, and was regarded as one of the best passers in the NFL. After the 2009 season, McNabb was traded to the Washington Redskins for a draft pick, and started 13 games. He started and played six games for the lowly Minnesota Vikings in 2011. Still, McNabb turned the boos and criticism of Eagles fans at the ’99 Draft into a highly successful 13-year NFL career. He was largely responsible for the Eagles’ tremendous success and NFC East “dynasty” of the early 2000s. A skilled playmaker like Donovan McNabb deserves to be honored, and the Eagles are right to retire his #5. Miguel Alfredo Gonzalez joins Raul Valdes as the only other Cuban player on the Phillies roster. Cuban baseball players are among the best in the world, and many have found success upon defecting to the United States. Reds pitcher Aroldis Chapman has developed a powerful legacy since he defected in 2010. Athletics outfielder Yoenis Cespedes recently won the 2013 Home Run Derby. And Dodgers outfielder Yasiel Puig has been the talk of the league, hitting .376 and leading the Dodgers on a hot streak of late. Now another Cuban sensation is headed to the major leagues. The Philadelphia Phillies announced the signing of 26-year-old pitcher Miguel Alfredo Gonzalez to a 6 year, $50 million contract. The contract is the richest contract ever given to an international player. According to a Yahoo Sports report,Gonzalez has “a fastball that sits around 93 mph and recently topped out at 96, a split-fingered fastball and changeup that serve as his off-speed pitches, a cut fastball and a slow curveball.” Gonzalez defected earlier this year to Cuba to Mexico and played in a low-level league there. The move comes as positive news for the Phillies who have struggled recently. The Phillies are 1-6 since the All-Star break, and currently sit at 49-54, 8.5 games out of first place in the NL East. Phillies ace pitchers have had a rough time this year: staff ace Cole Hamels is 4-13 with a 4.09 ERA, and 2010 Cy Young winner Roy Halladay has been out since May after undergoing shoulder surgery (not to mention his 8.65 ERS in 7 games). The only bright light on the Phillies staff has been Cliff Lee (10-4, 3.05 ERA), who remains the subject of trade rumors before next week’s trade deadline. The signing of Gonzalez is surprising for the Phillies. General Manager Ruben Amaro, Jr. continues to remain optimistic about the Phillies season despite the team’s recent slide. Three teams stand between Philadelphia and the last Wild Card spot in the National League. Players like Chase Utley and Cliff Lee could be on their way out of Philadelphia soon. Without substantial improvement from the pitching staff, Amaro could be forced to sell and rebuild. That’s where Gonzalez comes in. He has constantly impressed scouts in his baseball career. 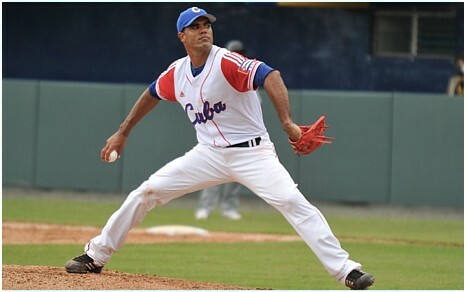 He succeeded as a star pitcher in the Cuban National Series, and succeeded again when he arrived in Mexico. At 26, Gonzalez would be one of the youngest pitchers on the Phillies roster. He will start in the Phillies minor league system (likely Triple-A Lehigh Valley) before being called up in mid-August, according to team sources. Not much is certain about Gonzalez’s future, but the addition of the Cuban star is still great news for a subpar team. Phil Mickelson becomes the latest golfer to have his name engraved on the famous Claret Jug. 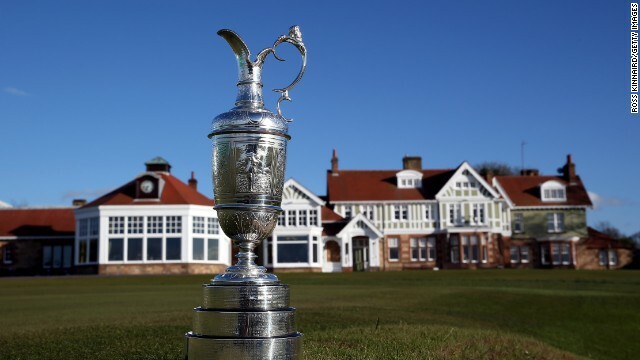 The Open Championship from Muirfield has not lacked drama at all this week. Playing in rough conditions, the normal names rose to the top of the leaderboard playing the golf we all love to watch. For the first two rounds it looked like Tiger Woods, Lee Westwood, and Hunter Mahan were the ones to beat as they played the course with the right amount of strategy and precision, yet the day and tournament belongs to one man and one man only, Phil Mickelson. Lefty showed complete guts, poise and composure, shooting a 66 in the final round of the tournament to finish at 3-under par. With a person who has a track record of falling apart in major championships that are not at Augusta, Michelson has learned to play a great round and tournament. Phil has finally played a complete game of golf and it does not look like he is slowing down at all. As we leave The Open Championship we have some great questions answered and still some questions that are sticking around. There is just one thing that we know is for certain; today is Phil Mickelson’s day and he rose to take one of the two monkeys off his back. Congratulations to you lefty your play the last two weeks has you as the most deserving player to hold up the Claret Jug. 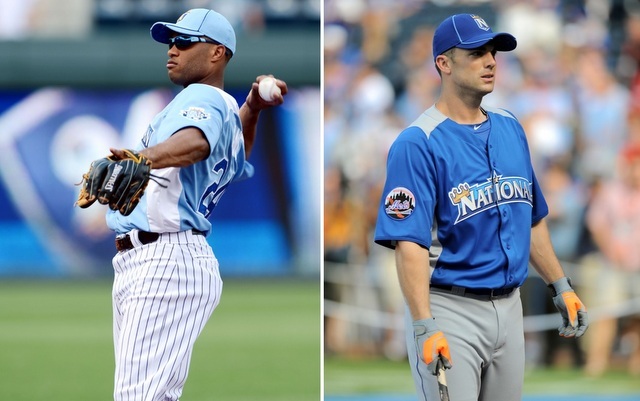 Yankees 2B Robinson Cano (left) and Mets 3B David Wright lead the rosters of sluggers in this year’s Home Run Derby. The 2013 Major League Baseball All-Star festivities kick off Monday night at New York’s Citi Field as eight of the best sluggers in the league participate in the Home Run Derby. Citi Field, home of the New York Mets, is known as one of the toughest parks for hitters in the major leagues, but recently underwent renovations to reduce the height of several outfield walls and to move right center field 17 feet closer to home plate. Still, Citi Field ranks as the most difficult park for hitters in 2013, and the eight stars below will have to bring their A games to win it all. Cano won the 2011 Home Run Derby in Arizona, but didn’t manage to record a home run in last year’s contest at Kauffman Stadium in Kansas City. Still, Cano is 7th in the American League with 21 home runs this year, and will find the short 330-foot dimension down the right field line to his liking. Cano might make the second round, but there’s just too much talent in this Derby. Nobody has had a hotter bat in the American League this year than Baltimore Orioles 1B Chris Davis. He leads the major leagues with 37 home runs this season. Davis is on pace for 62 home runs in 2013, and he has a chance to showcase his pure hitting skill in Monday night’s Derby. Fielder, the defending Home Run Derby Champion, also won the 2009 Home Run Derby. He is one of two multiple time Derby Champions (w/ Ken Griffey Jr.), but don’t expect Fielder to repeat. He only has 16 long balls this year and he has struggled some at the plate. That short right center field wall will look appealing, though. Cespedes is the most intriguing player on Team Cano’s roster. The 27-year-old Cuban is known for his hitting skill, but has only 15 home runs in 2013 after hitting 23 last year. He is a good ballplayer and hitter, and he definitely has the best name of the participants, but Cespedes might struggle Monday night. I’m not sure how much Home Run Derby practice he got in Cuba. He’s the hometown hero in this year’s Derby, but David Wright has only 13 home runs this season. He has opposite field power, which could help him with right center being moved closer to home plate, but Wright is a hometown pick, not the best hitter. No hometown player has won since 1990, and that trend will continue. Cuddyer is second in the National League in batting average, but ranks 8th in home runs. 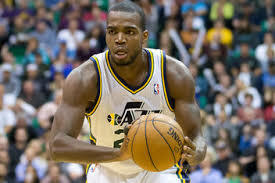 He’s not at home in Colorado where the thin air makes the ball fly farther. Cuddyer is a good hitter, but won’t have the power to win in New York. Originally, Carlos Gonzalez (leads the NL in HR) was supposed to participate. But when he was injured, Alvarez (second in the NL in HR) replaced him in the lineup. And rightfully so. Alvarez is a major reason for the success of the Pirates in the first half of 2013, and Pittsburgh deserves a slugger in the Derby. He could be a real threat at Citi Field. Harper isn’t the most popular player for Phillies fans like myself, but I believe the Nationals center fielder will win the 2013 Home Run Derby. Harper is known for his power at the plate, and though he only has 13 home runs this year, he is still a dangerous hitter. His pure, compact swing is great for making solid contact, and he will give the fans in the right field seats plenty of souvenirs. Harper is known for his Home Run Derby skills, hitting home runs of more than 500 feet at Tropicana Field as a high school sophomore. Now who saw this coming? After an abysmal 69 win season the Red Sox have completely turned it around. They only need 12 more wins to match their wins from last season. The difference between this season and last is that every player “wants to play all out” for John Farrell. Before being signed as manager this season, Farrell managed the Toronto Blue Jays, and before that he was the Sox pitching coach. Besides the improved pitching (mainly Clay Bucholtz) the Sox boast the league’s top offense. The Sox are second in the majors in batting average, first in runs scored, first in slugging and first in on base percentage. This team has a new grind it out mentality, and will be exciting to watch once October comes around. Let’s hope they continue to maintain their pace in the very competitive AL East. Cleveland is another surprising team that is in contention heading into the All-Star break. Managed by former Red Sox manager Terry Francona, the team has adopted his style of play: a grind it out style, as indicated by their record and statistics. The Indians are in the middle of the pack in all categories including: hitting, pitching and fielding. Do statistics tell the tale? The Indians sit 2.5 games back of Detroit, one of the favorites to come out of the American League. One will question if the Indians will be able to remain in contention throughout the remainder of the season closely behind Detroit. After clinching baseball’s best record of 98-64 last season, even by limiting ace Stephen Strasburg, the Nationals caught the league by storm. That brought even higher expectations this year, after being seen as a contender with the additions of center fielder Denard Span, and pitchers Gio Gonzalez, Rafael Soriano, and Dan Haren. This team was supposed to be better than last year’s, so why are they only 2 games above .500 baseball? They are in the middle of the pack in almost every hitting category, are in the top half of the league in pitching, but their defense has been dreadful. If the team gets back to their form from last year, they will be in contention for the playoffs, even playing sub-par baseball for half the season and only being 6 games back behind the Atlanta Braves who started the season on a blistering hot streak. After last season’s impressive and surprising first half, the Pirates headed into the second half of the season with the playoffs in their sights. After a 2nd half collapse, the Pirates stand in the same position as last year, but this year is different. This year the Pirates have loftier expectations. The pitching has improved, and has survived their rash of injuries, yet maintained a high level of baseball throughout the first half. One of the most underrated signings this year MUST be Francisco Liriano; he has pitched great for the Pirates with a 9-3 record with a 2.00 ERA. The main question coming into the season was their offense, and who would be able to help Andrew McCutchen carry the load. Starling Marte and Pedro Alvarez have helped carry the load so far this season. The offense is in the middle of the pack in almost all hitting categories, but with the good pitching the Pirates stay in contention in the highly competitive NL Central. They lead the league in opponents average and whip. If this trend continues after the break, I expect the Pirates to make the playoffs and even contend in the National League. One of the most explosive, fastest skaters in the game just retired from the game of hockey to go back to his home country Russia. Only 30 years old, Ilya Kovalchuk decided to retire with a whopping 12 years $77 million remaining on his 15 year $100 million contract he signed with the New Jersey Devils back in 2010. He was the centerpiece of the New Jersey Devils (besides future Hall of Famer Martin Brodeur) for the past four seasons leading the Devils to a surprising run to the 2012 Stanley Cup Finals losing to the Los Angelos Kings in 6 games. Over his career he had scored 417 goals and registered 816 points in 816 career games for 2 teams. Kovalchuk was the first overall pick back in 2001 by the Atlanta Thrashers (when Atlanta actually had a hockey team). On March 20th, 2012 Kovalchuk was the 87th player to record 400 goals while with the Devils. 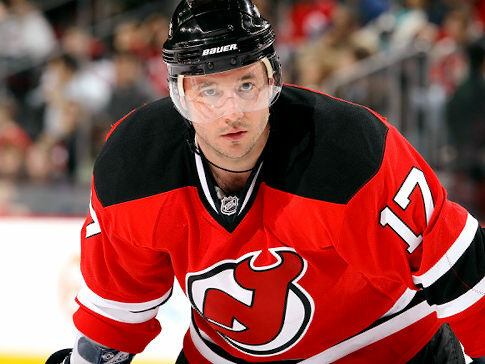 With the Devils Kovalchuk scored 89 goals, 112 assists for a total of 201 points. The next question after this surprising news, is what do the devils do? Over the last 2 years the Devils have lost 3 of their top players, Kovalchuk to retirement, David Clarkson and Zach Parise to free agency. If this is the beginning to things to come for the Devils, who’s the next to go, Brodeur? The Devils management now has questions to answer during the season. Do they try to contend for the cup within the next few years, or do they rebuild due to this shocking retirement?